Since the beginning, our focus has always been on our customers and meeting their needs. It’s for that reason that although we started out in the Christmas décor business, as we grew, we expanded into different markets first introducing the flags & banners division and then the site furniture division. In doing so we were able to further meet the needs of our already loyal customers and create new relationships as well, essentially becoming a one stop shop for enhancement products. As we continue to enhance our three divisions through the introduction of new products, we also want to further increase our offerings to our customers through a variety of services. You’ve read about our maintenance and refurbishing services as well as our storage facility, however our most utilized service would be our installations which we offer throughout the GTA in all three of our divisions. Installations are just one aspect of the turn key service we provide for our Holiday Displays, and it is the most popular. We manufacture a variety of holiday displays ranging from indoor, large scale Christmas trees to large LED roof mount and pole mount displays and we have the tools and capability to install all of it. Christmas installs begin in early October with general tree lighting taking place first with the large Christmas Display installations beginning after Halloween. Our crew of well trained installers work through the night installing displays on light poles on town and city streets, in parking lots and on office buildings to bring a touch of the Holiday spirit to well traveled areas. The work takes place at night to ensure we aren’t impeding any major traffic with our trucks and workers. Interior Christmas installations also take place during off hours to avoid interrupting business and foot traffic in malls and office buildings. Our crew takes the utmost care when installing these large and often heavy displays and uses a variety of different techniques to ensure they are properly secured and will remain in place in whatever weather Mother Nature throws at us. We understand that sometimes our customers don’t have the staff or time to install large pieces of site furniture that they order from us. That’s why we offer an installation service for our customers located within the GTA. 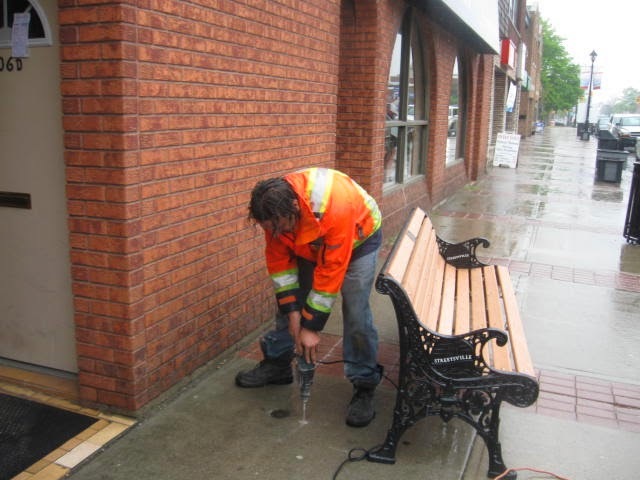 We recommend that all site furniture be affixed to the ground to ensure your investment doesn’t disappear overnight and we use stainless steel hardware to avoid rusting and maintain an aesthetically pleasing look. If you are replacing existing pieces we are happy to remove the existing site furniture and take it off of your hands or deliver it to where it needs to be. All we require for installation is a detailed map of the area to show us where all of the pieces are going and we will do the rest for you! 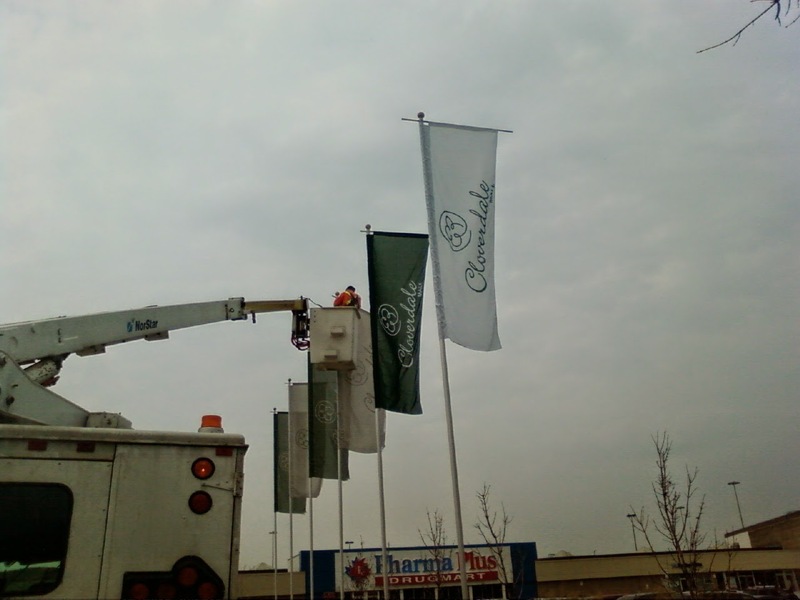 The installation of banners is also a very common request we receive and something we do regularly. We will not only install banners that we have manufactured for you but we will also install any existing banners you already have. We can do this on existing hardware or start from scratch and install new hardware that can be purchased with us. Much like with the installation of site furniture all that is required is a map outlining the location of all the poles that will be receiving banners and which banner if you have multiple designs. Again we can do these installations later in the evening or early morning to ensure we are not affecting traffic. For all of our installations, regardless of what division of products you are ordering from, we will do a site meeting with you where we can determine the location for all of the pieces. During the visit we will inspect the area to note what type of fixtures and materials we are affixing the enhancement products to so we have the proper hardware to do so. Let us do the heavy lifting so you don’t have to!